London Slant: What are London’s three most important ships? All aboard to explore! Can you name London’s three most important ships? There’s Cutty Sark at Greenwich, of course, and HMS Belfast beside Tower Bridge. But what’s the third? SS Robin, raised up on her pontoon dais. Congratulations to all who immediately shouted SS Robin, whose crimson flanks catch the eye at east London’s Royal Victoria Dock, close by City Airport and ExCel. She completes London’s great seafaring trio—our only ships to be part of Britain’s National Historic Fleet, the nautical equivalent of a Grade I listed building. 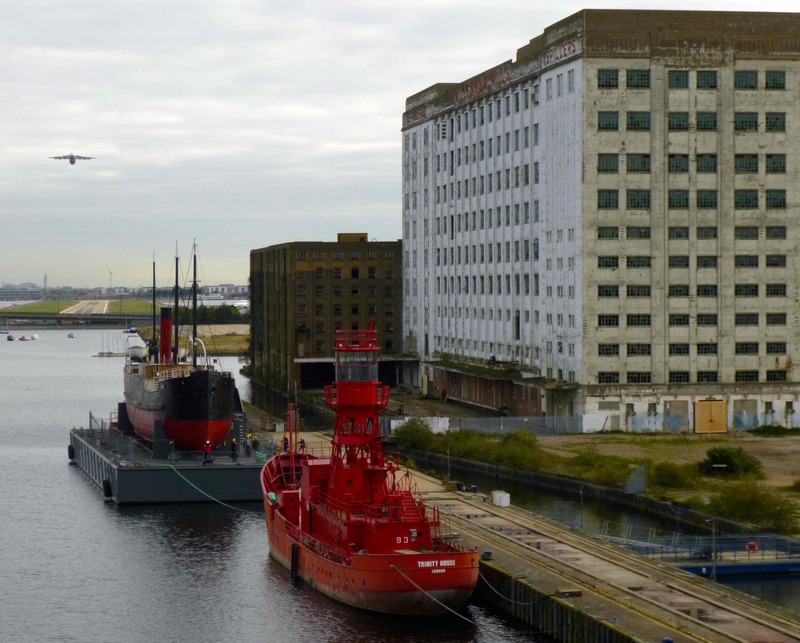 SS Robin seen behind a light ship, adjacent to Millennium Mills, with City Airport as a noisy neighbour. Curious to see why SS Robin merits this acclaim, I hopped on the Docklands Light Railway to explore. I found her nestling in the shadow of Millennium Mills, a grand but abandoned early 20th century factory which, like the former steam coaster herself, is part of a wharf landscape now being revived. Visitors can tour the ship with its expert project leaders and roam the decks, opening doors and peeking into the innards, to view restoration work in progress. Soon she will open as a museum ship that showcases both her beauty and the colourful story of her life on the high seas. SS Robin was built in 1890 at the famous Thames Ironworks shipyard on London’s River Lea, just a mile from where she currently resides. Her first adventures took her around Britain and Northern France as she carried cargo including grain, coal, steel and granite to build Scotland’s Caledonian Canal. In 1900 she sailed off to work in Spain where she changed her name to Maria and continued “in steam” until 1974. 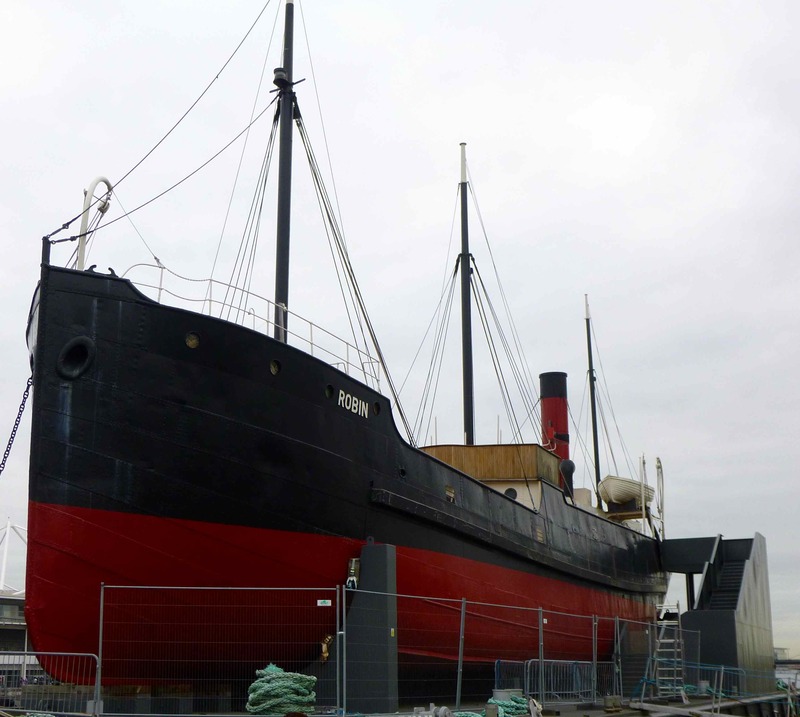 When SS Robin then returned to the UK for preservation a difficult choice eventually had to be made: should she be kept intact or should much of her original structure be replaced to maintain her seaworthiness? When I got up close to the wonderfully battered sheets of steel that make up her bow, it was clear that the decision to take her out of the water was correct. Every joint and rivet spoke of great Victorian engineering and every pitted surface of a life well lived. 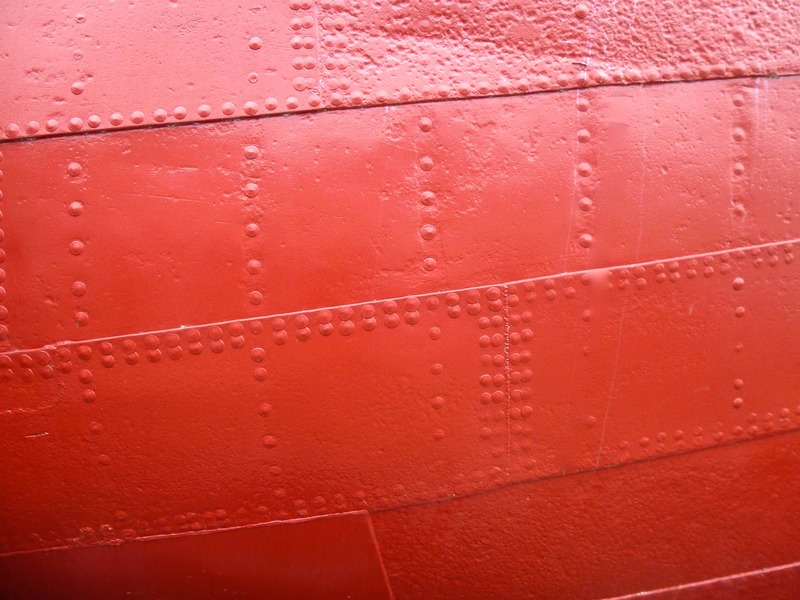 Fabulous flanks: the crimson body of SS Robin close up, all pitted steel and beautiful rivet work. SS Robin now sits in grandeur, raised up on her own pontoon vessel. I marvelled at her propeller and coal/oil-fired engine room—and how the 12-strong crew survived endless days in cramped quarters and exposure to the elements out on the upper deck. But, just as the craft herself remains the only complete steamship still in existence, endurance is the name of SS Robin’s game. Read more about SS Robin‘s fascinating history and sign up for tours, with proceeds going to fund the continuing restoration project to turn this national treasure into a heritage, community and education centre. Other activities in the area include walking over Royal Victoria Dock Bridge and a trip on the Emirates Air Line—both offering great views. This entry was posted in ART + MUSEUMS, LONDON, Uncategorized and tagged Cutty Sark, HMS Belfast, LONDON, Millennium Mills, museum, SS Robin on January 25, 2015 by londonslant. Thanks KP. I thought of you when I mentioned the light ship! Yes, all good here and hope it’s the same for you.